Built during the 1970s with equipment purchased from abroad and foreign financing, the Namhung Youth Chemical Complex has developed into the nation’s “premier petrochemical processing complex.” The facility is a major producer of chemical fertilizers, herbicides, insecticides and polyethylene sheeting—all critical to the agricultural sector—as well as a range of synthetic textiles and chemical products important to the nation’s industrial sectors. All three North Korean leaders have regularly visited the complex, committed significant financial resources to its maintenance and expansion, and emphasized its importance to the economy. Figure 1. Namhung Industrial Area in 2013. 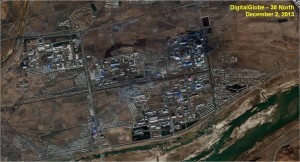 North Korea has engaged in a major effort to modernize and expand the chemical complex as well as the Namhung Industrial Area (see insert) since 2006 despite international concerns—and sanctions—resulting from its nuclear and long-range missile programs. The announced increases in annual food production in 2014 are likely to have been influenced by the completion of a comprehensive and expensive seven-year project to establish, and then expand an anthracite coal gasification plant and undertake general rehabilitation of the complex. 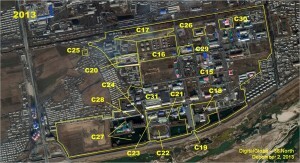 In addition to its role in the civilian economy, since the early 1990s, officials from South Korea and Japan as well as North Korean defectors have identified the Namhung Youth Chemical Complex as being involved in the production of chemical warfare agents. The seven-year construction effort also has the potential to materially improve the quantity and quality of the North Korean chemical weapons inventory. Figure 2. 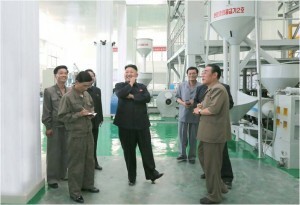 Kim Jong Un providing field guidance to the Namhung Youth Chemical Complex on June 20, 2013. Following the Korean War, the DPRK spent the next decade rebuilding its social and industrial infrastructures, focusing primarily on mining and heavy industries. Beginning in the late 1960s, major construction programs developed and expanded its fledgling chemical industry. As part of the 1971-76 Six Year Economic Plan, the Supreme People’s Assembly (SPA) proposed the construction of a large industrial area at Namhung-dong, Pyongan-namdo (South Pyongan Province), approximately 4 km northeast of Anju. The single largest facility at this new area was to be an integrated petrochemical plant—the Namhung Youth Chemical Complex—with a capability to produce 400,000 tons of urea fertilizer annually. Funding for the complex was reportedly supplemented by loans from Japan, while equipment was obtained from domestic and foreign sources including France, Japan and West Germany. By 1976, initial production of ammonia by naphtha gasification, acrylic and polycarbonate fibers and urea fertilizer had commenced. Throughout the 1980s into 1990, the complex continued to expand with the addition of new process lines. Figure 3. 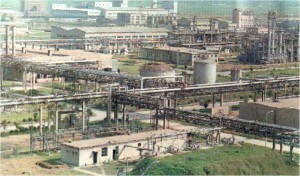 Namhung Youth Chemical Complex, looking northeast from the petro-chemical plant, 1994. Image: Foreign Trade of the Democratic People’s Republic of Korea, 1994. The collapse of the Soviet Union in 1991 and the subsequent loss of economic aid, coupled with droughts, floods, famine and unsound economic policies, created the crisis known as the Arduous March. At the same time, much of the foreign origin industrial equipment at the Namhung Industrial Area and the Youth Chemical Complex were in need of overhaul or replacement. During 1995, the North sought funding from abroad to purchase replacement parts and undertake repairs at the chemical complex and other critical industrial areas. These efforts were largely unsuccessful since the North had previously defaulted on loans secured during the 1970s. By the early 2000s, as the economic crisis began to ease, additional resources were committed to minor expansion projects including upgrading the sodium bicarbonate, naphtha, ammonia and urea processing lines and continuing the computerization of production processes begun during the early 1990s. Most significantly, however, Pyongyang announced that in addition to the general refurbishment of the Namhung Industrial Area, an anthracite coal gasification plant was to be constructed at the chemical complex to increase fertilizer production. This new plant was to be the showcase project for the revitalization of the North’s chemical industry and the largest project undertaken at the complex since it was built. Construction began in 2006, and by May 2009, the first anthracite gasification processing line was almost complete. In April 2010, KCNA announced that fertilizer production based on anthracite gasification at the complex had begun. 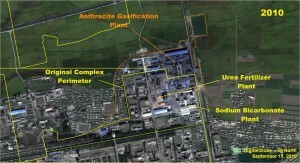 By May 2011, construction of a second anthracite gasification processing line was finished. Figure 4. Anthracite Gasification Plant, looking southwest, January 16, 2014. Despite the general refurbishment of the Namhung Industrial Area and the successful construction projects at the Namhung Youth Chemical Complex, operations during 2011-12 remained hampered by an intermittent, low-quality electricity supply, due to an antiquated and failing national power grid. In March 2012, however, with the completion of construction at the Huichon No. 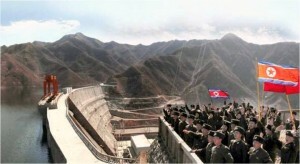 2 Hydroelectric Power Station, the North Korean media began reporting that electricity available to the Namhung Youth Chemical Complex—80 km to the southwest—had increased. This, in turn, has resulted in an increase in the complex’s overall output. Figure 5. Huichon Power Station, May 2012. 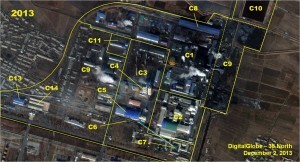 In addition to its important role in the North’s civilian economy, the South Korean Ministry of Defense’s Defense White Papers from 1990-2010, defector accounts and media reports state that the Namhung Youth Chemical Complex is involved in the production of chemical weapons for the Korean People’s Army (KPA). While its exact role remains unclear, at a minimum, it would appear that the complex is involved in the production of chemical precursors, which are then shipped elsewhere for combination into agents and munitions filling. Its role, however, could be more significant as one source states that it produces “blood” agents (e.g., hydrogen cyanide). 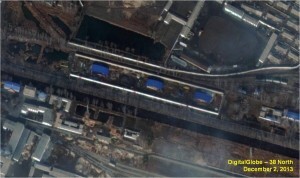 The complex has also been implicated in the April 2004 explosion of a train at the Yongchon Rail Station. According to a July 2004 JoongAng Monthly article, “[the train carried]…a load of biological and chemical weapons manufactured at the Namhung Youth Chemical Complex… it produces biological and chemical weapons) on freight cars. This complex has been the site for the most significant changes in the area, covering approximately 1.9 km2 and can be divided into two function areas: north and south. The Northern Area covers approximately .6 km2 north of the central drainage canal and includes over 100 structures. These include (figure 6) a new anthracite gasification plant (C1) covering approximately 225,000 m2, sodium bicarbonate plant (C2), urea fertilizer plant (C3), urea fertilizer storage silo (C4), urea fertilizer storage shed (C5), rail fertilizer-loading facility (C6), truck fertilizer-loading facility (C7), coal unloading facility (C8), coal storage facility (C9), retention pond (C10), power substation (C11), a secure storage area (C12), rail engine servicing facility (C13) and a railcar maintenance/repair facility (C14). Figure 6. 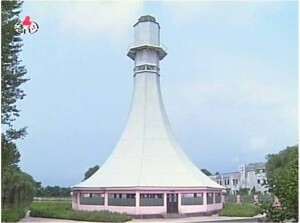 Namhung Youth Chemical Complex—North. Construction of the new anthracite gasification plant began in early 2006 by grading and expanding a 44,000 m2 section on the northeast corner of the complex. Between 2006 and 2010, the area under development expanded to first encompass approximately 152,000 m2, and then to 225,000 m2. This included the addition of a rail line to a newly constructed coal unloading facility, construction of the gasification plant itself and excavation of a 17,000m2 retention pond that was almost complete. Grading of a large coal storage facility was also underway. Supporting these developments, three of six storage tanks were razed and upgrades, refurbishments and additions were undertaken throughout the chemical complex. In the northern half, these improvements included the construction of a new rail engine servicing facility, refurbishment of at least 12 buildings including the power substation and urea fertilizer plant. During 2010-11, the sodium bicarbonate plant began a reconstruction program, the railcar maintenance/repair facility was expanded and the three remaining old storage tanks were razed. Figure 7-1. A comparison of the Namhung Youth Chemical Complex, northern section, showing the construction of the Anthracite Gasification Plant. Figure 7-2. A comparison of the Namhung Youth Chemical Complex, northern section, showing the construction of the Anthracite Gasification Plant. Figure 7-3. A comparison of the Namhung Youth Chemical Complex, northern section, showing the construction of the Anthracite Gasification Plant (2013). Figure 8. Anthracite Gasification Plant, looking northeast, August 12, 2009. Note the storage tank under construction on the left side of the image. Figure 9. Storage tank under construction in the Anthracite Gasification Plant, looking southeast, August 12, 2009. Figure 10. 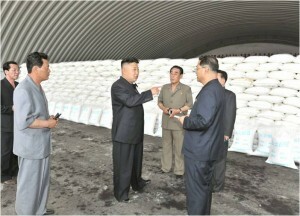 Kim Jong Un inside the urea fertilizer storage building, June 20, 2013. During 2011-13, a secure storage facility occupying approximately 8,100 m2 and consisting of three buildings within a walled compound was constructed west of the rail engine servicing facility. Figure 11. Namhung Youth Chemical Complex, Northern Section, new secure storage area. The southern half of the Namhung Youth Chemical Complex covers approximately 1,322,000 m2 and consists of the petro-chemical plant (C15), storage tank farm (C16), rail loading facility (C17), headquarters and administration building (C18), main entrance (C19), livestock facility (C20), cultural welfare facility (C21), stadium (C22), Workers’ Boarding House (C23), Nano Technology Laboratory water tower (C24), two power substations (C25 and C26), fish farm (C27), greenhouses (C28), Chongchon Health Complex (29), Polyethylene Sheeting Factory (C30), Anju Polyester Spinning Factory (C31) and support buildings. Beginning in 2006, the southern half of the complex also began a program of upgrades, refurbishment and modest construction. Figure 12. 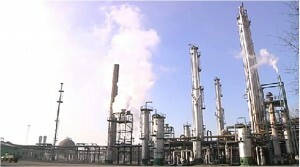 Namhung Youth Chemical Complex, Southern Section. Figure 13. Nano Technology Water Tower, August 1, 2010. 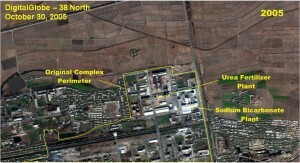 North Korea conducted a significant expansion of the Namhung Youth Chemical Complex (and surrounding industrial area) from 2006 through 2013, which continues today despite growing international concern—and sanctions—as a result of its nuclear and long-range missile programs. Approximately 106 buildings/industrial structures were constructed and 50 were repurposed or refurbished—an unprecedented endeavor during a politically turbulent and economical constrained period. This expansion is a reflection of the level of commitment by the North Korean leadership to modernize this area as well as its central importance in Pyongyang’s effort to improve its economy. Kim Jong Un and the DPRK leadership view the expansion of the Namhung Youth Chemical Complex as a key component in the efforts to address the nation’s chronic food shortages. Specifically, the construction of the anthracite coal gasification plant and the rehabilitation of the urea fertilizer plant have resulted in increased fertilizer production. This, in turn, has resulted in increased productivity in the agricultural sector. 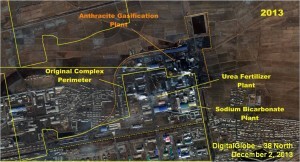 Beyond the beneficial impact on the civilian sector, the construction of the anthracite gasification plant and general improvements at the chemical complex have the potential to materially improve the quantity and quality of the North Korean chemical weapons inventory. One of the more vexing questions surrounding the construction of the anthracite gasification plant is whether the DPRK was able to accomplish this task using indigenous resources alone or whether it received foreign assistance? Given the current rundown and obsolescing condition of the North’s chemical, manufacturing and heavy industries, it is probable that a portion of the equipment, and possibly some technology, was acquired abroad. From where, exactly, remains unclear, but China—the DPRK’s largest trading partner, would seem to be a logical candidate. Satellite imagery is best viewed by the human brain from the “sensor look angle”—the viewing angle from the satellite’s perspective. This often means that North is not at the top of the image. When viewing imagery of the same location over time, the sensor angles are rarely the same and presenting comparison imagery at the sensor look angle can be disorienting to the reader. Therefore, unless otherwise noted, imagery in this paper is oriented with North being at the top of the image. The Namhung Youth Chemical Complex is sometimes identified as the Namhung Youth Chemical Combine, Anju Namhung Chemical Plant or Anju Textile Chemical Factory. 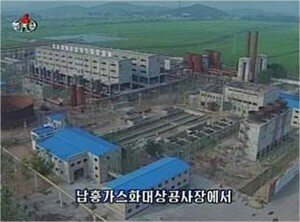 According to a 2003 report by the Korea Trade-Investment Promotion Agency the Chosun Namhung General Trading Corporation, located in Silli-dong, Tongdaewon-guyok, Pyongyang, is the import-export agent responsible for the DPRK’s chemical complexes including the Namhung Youth Chemical Complex. North Korean Trading Companies, (Seoul: Korea Trade-Investment Promotion Agency), June 19, 2003. On January 16, 2014, KCNA announced, “As of January 15, the complex has over fulfilled its daily quota [of fertilizer production] by 50 percent when compared with the same period of last year.” “Namhung Youth Chemical Complex Boosts Production,” KCNA, January 16, 2014. Kim Yong Yun, “North Korean Chemical Industry,” Pukhan, December 1998, pp. 132-143. Ibid., p. 27; and “North Trying To Secure Private Japanese Loans,” Chosun Ilbo, June 8, 1995. Pak Tae-ho, Industry of North Korea, (Seoul: Korea Development Bank), February 1996, pp. 1-37. “North Trying To Secure Private Japanese Loans,” Chosun Ilbo, June 8, 1995, p. 27. “Visiting the Front-runners of Technical Innovation,” KCTV, August 25, 2003. Kim Chi Kon. “Greater Research Results Modernizing the People’s Economy,” Rodong Sinmun, December 1, 2002, p. 4; Cha Myong Chol. “Chemical Industry Being Refashioned,” Pyongyang Times, March 24, 2001; Kim Yong-yun. North Korea’s Organizational Restructuring of Factories and Enterprises: What Does it Mean? (Seoul: Korea Institute for National Unification), March 2000, pp. 88-89; Korea Institute of National Unification, North Korea Overview for 2000, (Seoul: Ministry of Unification), December 29, 1999, pp. 311-388; and Pak Tae-ho, Industry of North Korea, (Seoul: Korea Development Bank), February 1996, pp. 1-37. “The Proud Feats of All People’s General Offensive,” KCBS, October 8, 2010; and “N. 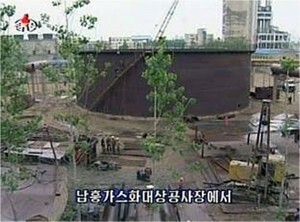 Korean Firm Begins Fertilizer Production Using Anthracite,” Yonhap, May 6, 2010. “Kim Jong Il Gives Field Guidance to Namhung Youth Chemical Complex,” KCNA, May 7, 2011. “Achievements Scored in Economic Sectors in 100 Days,” KCNA, March 26, 2012; “Towards a Higher Target” Korea, No. 677 May 2012, p. 38; “DPRK Premier Inspects Power Station, Precision Machine Plant in Huichon,” KCNA, April 2, 2012; “DPRK Commends Builders of Huichon Power Station,” KCNA, April 6, 2012; and “SPA Session on Work of Cabinet Last Year and Its Tasks for This year,” KCNA, April 13, 2012. Yi Chung Kuk—a defector who was a member of the KPA’s Nuclear Chemical Defense Bureau—identified the “Anju Namhung Chemical Complex” as being involved in the production of chemical agents and that the “37th Nuclear-Chemical Defense Battalion” was stationed at the complex. Another DPRK defector Ko Chong Song stated, “…the Namhung Chemical Factory, which exclusively produces chemical weapons in a number of factories. …[T]his is a chemical weapons factory that researches, develops and produces various chemical weapons.” Refer to Ko Chong Song, Kim Jong-Il’s Secret Weapons Factories, (Tokyo: Bijinesusha), 2001, pp. 3-5; U Chong Chang, “DPRK Nuclear War Preparations,” Chugan Chosen, June 30, 1994, p. 26–28; and Yi Chung Kuk, Kim Chong-il’s Nuclear Weapons and Army, (Tokyo: Kodansha), 1994. Interview data acquired by Joseph S. Bermudez Jr.; Ministry of National Defense, Defense White Paper, all volumes from 1990–2010, (Seoul: Ministry of National Defense), 1991–2011; Kim Kyoung-soo. “North Korea’s CB Weapons: Threat and Capability,” The Korean Journal of Defense Analysis, Vol. XIV, No. 1, Spring 2002, pp. 76-77 and 90; “Nuclear, Chemical, Biological Warfare Research Detailed,” Naewoe Tongsin, No. 903, June 9, 1994, pp. B1-B4; “Food Shortages Said Worsening; No Relief Seen,” Pukhan, June 1993, pp. 138-147; “North Korea Major Producer of Biochemical Weapons,” Vantage Point, November 1992, Vol. XV, No. 11, pp. 23-25; “DPRK’s Advanced Weapons Analyzed,” Korea Times, February 8, 1991, p. 8; and “North Stockpiling Biochemical Weapons,” Yonhap, June 23, 1990. To produce a chemical weapon, the basic ingredients (i.e., precursor chemicals such as alcohol) need to be produced first. These are then combined (using various processes) to produce the actual chemical agent, which is typically stored in bulk tanks. The bulk agents are then used to fill the empty munitions (e.g., warhead, bomb, etc.). These processes often take place at different locations. A precursor producer is a significantly more benign facility and lower on a target list then a facility producing the actual agent or filling munitions. Most precursors are by their nature dual use. “North Korea Major Producer of Biochemical Weapons,” Vantage Point, November 1992, Vol. XV, No. 11, pp. 23-25. Choe Yong-chae, “Yongch’on Explosion Was Due to ‘Scud-D Missiles,” JoongAng Monthly, July 1, 2004, pp. 92-97. Sodium bicarbonate is used in a wide variety of industrial, medical, cleaning and domestic environments. In the chemical industry it is often used to neutralize acids and purify other chemicals. In the nuclear industry it can be used in decontamination.